Robert Smith was a two-sport star at Ohio State. In addition to being a standout running back with the football team, Smith put in a fair amount of work with the track team as well. At age 42 with a bum knee, he is still faster than you. Smith ran for 1,945 yards in the two seasons he played at Ohio State, averaging 88.4 yards per game and rushing for 18 touchdowns. He led the Buckeyes in rushing in 1990 and 1992, topping the 1,000-yard mark with 1,126 in 1990. His time in Columbus was a bit tumultuous, but when he was on the field, Smith was lightning in a bottle. He was a threat to take the rock to the house on every carry. Built much differently than many OSU running backs of his era, Smith looked like the track star he was. But he was as effective as any. And he was an effective pro player. Smith was taken 21st overall by the Minnesota Vikings in 1993 and rushed for 6,818 yards and 32 touchdowns in just eight seasons in the NFL, despite being hampered by a rash of injuries early in his career. He also caught 178 passes for 1,292 yards and six touchdowns. He was named to the Pro Bowl twice (1998 and 2000) and was a second-team All-Pro selection in his final season. We recently caught up with Robert and asked him about his life as a child in Euclid, his time as a Buckeye, his one-year sabbatical from the team, the Vikings, the four-letter network and more. Were there any teams or players you remember watching as a kid? Robert Smith: I was a Steelers fan, in Cleveland of all places. But there was Mean Joe Greene, Lynn Swann, Terry Bradshaw and Franco Harris. There were a lot of big names then and it didn't mean anything to me to root for another team just because you lived in one place. It just never occurred to me that you were supposed to be loyal to the hometown team. When did you start playing organized football? RS: I didn't start playing until I was 11, getting ready to turn 12, so I was in the sixth grade when I first started playing. What was life like for you, growing up in Euclid? RS: It was chaotic. My father was a drug addict and a drug dealer, in and out of hospitals, involved in shootouts and all kinds of crazy stuff. It was a very disruptive in the home. We didn't get him out until I was about 13 or 14. Sports were really an escape. I wanted to be out of the house as much as possible. So I wasn't watching as much sports growing up. Football and track were really it. I didn't watch an Ohio State game until I was being recruited. I was doing other things. I would watch the Steelers occasionally, but as I got older I wasn't even doing that anymore. I was either running track or playing football or just outside doing something else. I didn't want to be home. When did you first realize you might be more gifted than most of the guys you were playing with? RS: The first year that I played. It was clear that if I had any kind of opening that I was going to score a touchdown. The track coach's best friend was the football coach. I always loved track and wanted to run track and my track coach suggested I go and see his friend and play football. When I did, it was apparent right away that I was faster than everybody else. I wasn't very big. I was a wiry kid. I was always a tall, thin kid. At what point did the colleges start looking at you? RS: My freshman year I played freshman football the whole year. And then my sophomore year I started on the varsity team after the first game. From that point forward, the smaller schools started (showing interest). And really before that I started receiving letters from schools about track. After that season is when my head coach Tom Banc sat me down and said, "This is going to get kind of crazy so let's narrow the list of schools down right now. When all these people started coming to ask, we'll tell them thanks but no thanks if they're not on that list." There were a couple schools that weren't on the list that I made unofficial visits to—Notre Dame and Michigan. Michigan wasn't my idea. My coach said, "Bo Schembechler wants to see you and you are going to see Bo Schembechler." I said, "OK." So I went up to see him the summer before my senior year. Notre Dame, I just went to a game. Smith's high school senior picture. RS: USC was number two. Then UCLA and the University of Miami. They were really just the schools that I knew. I wanted to run track and play football and they were the schools I knew—like I said, I didn't grow up watching college football—so it never even occurred to me (to look at) Alabama. I'd never even heard of Virginia Tech. There are just a lot of schools that never crossed my mind because I never watched college football. But those were the big names and I had interest from all of them. I figured if it wasn't going to be one of those schools, then I was going to stay close to home and make it convenient for my mother to get down and see games. If I was going to go, I was really going to go. What sticks out in your mind about arriving on campus at Ohio State? RS: Just how big it was. That leap from being at a high school to being on a big college campus that's a city. It really kind of sticks in your mind. It's almost surreal that things get to that level. When I was in the sixth grade, one of the parents said, "I'm looking forward to seeing you play professional football somday," and all this kind of stuff. You kind of take that stuff and put it in the back of your mind—and you realize you're good, but to actually be in that situation where you're visiting these gigantic, places and multi-million dollar facilities, it's really strange. It's a little surreal, a little bizarre, a little intimidating. Which players were you close with during your years in Columbus? RS: My roommate Bill Lorensen was my best friend in high school. I had known him since the eighth grade. He went down to school with me. He walked onto the team when I was a freshman. So we were roommates the whole time. Joe Pickens, until he left, I was close with him—(Steve) Tovar, and, by the time I left Big Daddy (Dan Wilkinson) and I were pretty close. As far as the track team, Aaron Payne and Rick Jones were good friends. 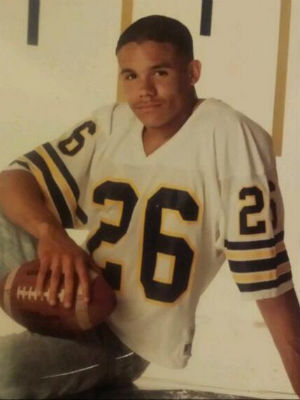 After a big 1990 season, you left the football team. What really happened? RS: I think the best way to characterize it is that honestly I got bullied out of the program. From speaking to other coaches that worked on that staff, (former offensive coordinator) Elliot Uzelac didn't want me on that team. He didn't like me. He thought I was babied, pampered, and made it a point to push with me right away to kind of put pressure on me psychologically. He was a bully. It came to a head in the summer, sitting in the locker room where I was missing a morning class to go to a lab to stay on schedule to take organic chemistry that fall. He came up to me and said I know the school thing is important but we've got to have you here instead of class next week. And that was like the last straw. I ended up sitting out that year. By the time I left the team I was really under distress, just kind of feeling bullied and pressured and confusion and anger. Rather than come back and be a distraction I thought it was best to just walk away from the team at that point and stay away from the team for that whole year. So I switched to a track scholarship and ended up taking organic chemistry that fall and was preparing for the track season. It was interesting. What paved the way for your return to the football team? RS: Actually, I was going to transfer and I didn't know the transfer rules. It was my understanding that you just needed to spend two semesters at another school and you could play. I went and visited USC again and I visited Stanford, and that's actually where I met Denny Green, who ended up drafting me. I went to those places and was going to transfer and play the next year. But as I became aware that I'd have to sit out the next year—I wanted to play the next year, I didn't want to take two years off. Coach Cooper always said, "The door's open if you want to come back." And so I told him I wanted to come back and he set up a meeting with me and him and Elliot and we sat in the room. It was Coop basically saying, "You can agree to disagree, just don't be disagreeable and we're going to work this thing out. You guys are going to have to be in the same locker room on the same team and that's the way it's going to happen." Everything seemed fine and Elliot asked Coach Cooper if he could speak to me alone. He left the room and Uzelac pulls out a tape recorder and says, "Why did you lie to Sports Illustrated?" I said, "Coach, you know I didn't lie to Sports Illustrated." And he repeats the question. I thought, this is pointless. I got up and left the room and Cooper's standing out there in the hall and I said, "Coach, that guy's got a problem." So I left and apparently Uzelac had a lawsuit against Sports Illustrated or something like that and was asked to withdraw the lawsuit and didn't, and so he was let go. And so the story became that I got him fired and all this kind of stuff. It was an interesting set of circumstances. How did your teammates react to the situation? RS: I remember that spring being in the bar and running into Herbstreit and saying, "I'm going to come back." It was interesting. A lot of guys went through a lot in that period of time and some of them felt betrayed. But some of them understood that I really didn't know how to deal with a guy that wanted to bully me. When I made the decision to come back to the team it was "I can't let one person impact my life this way. I just can't do it. So I've got to come back and play." What’s your favorite memory of playing at Ohio State? RS: The first time being out there for a real game, against Texas Tech—90,000+ in the stands and just that excitement and that energy that you feel coming out of the tunnel into a stadium that's just so big and filled with scarlet and gray. It's just an amazing feeling. And it's such a huge step from high school football, where you've got that one home side stand and then then you've got the away stand with 30 or 40 people in the stands. And then all of a sudden you're playing in front of all these people, there's all this energy, there's so much talent everywhere, there's so much passion around it. That's why I feel so fortunate right now, covering the greatest sport in the world at the greatest level of the sport, which is college. The passion, the pageantry, the history of the game, the traditions of the game—you just can't surpass it. Just being a part of that for the very first time in a real game, that was probably the highlight for me, to tell you the truth. Just feeling that energy and that excitement, mixed with anxiety that you feel before the game for the very first time. Smith, Cris Carter and Daunte Culpepper.. The Vikings took you in the first round in 1993. What was your draft day like? RS: I remember going to Bob Evans that morning with one of my roommates and I could barely eat, I was just so nervous. I had been at the Penn Relays (track meet) the day before, so I had to fly back from Philadelphia. I just remember the anxiety. It's not like college, where you know where you're going to go. You make that decision, and now you're waiting for somebody to draft you. You have your expectations and all the prognosticators are guessing when you're going to be drafted. You have some idea maybe and you're just kind of waiting around. It's a tough feeling to have to sit around and wait for that. I remember Miami picking somewhere around 13th or 15th. They were the last team that I heard might draft me I think until Dallas drafted somewhere around 25th or so. So you're already an hour and a half into the draft and I turned the channel. I was watching Ren and Stimpy and coach Green called. I picked up the phone and he said, "I let you get away once, I'm not going to let it happen again." You talk about surreal. I remember packing the suit and my roommate drove me to the airport. I remember I had Lenny Kravitz on the stereo, listening to the Are You Gonna Go My Way album and I remember the song "Believe" came on and it was just so cool hearing that song and thinking about the possibilities of being in a new place and playing the game professionally. It was amazing. How was your adjustment to the NFL? RS: Honestly, my first day of college football—when the upperclassmen were there—that was a lot worse for me than my first day in the NFL. When the upperclassmen got to Ohio State, I spent the first 10 minutes of that practice thinking I'm going to be the biggest flop in college football history. I'm watching this practice and thinking how in the hell am I going to be able to withstand this. You see the velocity and the ferocity of the game. When those bullets are flying in practice, it's intimidating. You put together a string of four straight 1,000-yard seasons from 1997 to 2000 and then left the game after a 1,521-yard year. Why did you retire while you were at the top of your game? RS: My last season was the only season I didn't miss any games and I still needed knee surgery after the year. So I was thinking, "How many times am I going to do this to myself?" I would have literally been like a 45-year-old knee replacement guy. The phrase that I used all the time is that it's better to walk away early than to limp away late. Too many players do that and there's nothing that's worth that. People lose perspective when they think about money. And they think, "Why would you give up all that money?" But the thing that I always thought was, you'd give any amount of money to get your health back if you lost it, then what amount of money is worth the very real chance that you'll lose it? I knew that I was at that point. I might have had one or two more good years in me but it wouldn't have been worth the price of playing. And how is your health after all this time? RS: It's good. My right knee still swells up. I'm going to need another surgery on it at some point, probably, unless one of these stem cell treatments turns out to be useful. I've got some damage in that knee—that was the one that I had two microfractures in my last three years in the league—so I know that's a problem area. But I can bend down and play with the kids. I was just jumping around on the trampoline over the weekend with the kids. I knew when I left the game I wanted to have kids and I wanted to be able to run around and act a fool with them and that's exactly where I am now and I couldn't be happier. You are one of many former Buckeyes in broadcasting, and most are at ESPN. How did you end up there? RS: I wrote a book in 2004 and my agent reached out and asked if I was interested in doing television. And I said, "What, you mean like CNN?" And he kind of laughed and said, "Why don't we start with sports." ESPN had just fired Trev Alberts and they needed someone and they offered me a position. It was total blind luck. And I'm so lucky because I had no idea how much I'd miss the game. What would you say to the fans who think ESPN gives Ohio State the short end of the stick? Smith as "Howard the Hunk" on MST3K. I have to ask this, because my podcast partner Johnny and I are big fans of Mystery Science Theater 3000—how on earth did you land a role on the show? RS: Me and my friend watched it all the time and when I got drafted by the Vikings, I was basically right across the street from their studios. We got to go over and see a taping and we were like kids in a candy store. I remember thinking, "This is the coolest thing ever." They asked if I wanted to be on and I said yes. I was the first ever guest on the show. I played Howard the Hunk. While in school, your desire to work in medicine after football was well publicized. Did you ever get to work in that field? RS: I never worked in medicine, but I worked around it. When I retired I got involved with a company that was doing pharmacy and medical claim analysis. I worked a little bit on the e-commerce side with sales. And actually right now we're working on a community health project with Ohio State and hopefully we'll be launching that this fall. How often do you get back to Columbus? RS: I moved from Columbus (to Texas) in 2004 and during the season I have to be in Connecticut on the weekends, so I can't go to the games. But I'm usually in Columbus four or five times a year. That's probably going to increase now that we're going to be working with the school. So that's exciting because I'll get more opportunities to be there. But I definitely miss Columbus. It became home for me and I have a lot of special memories. I'm looking forward to being there more.